Built in 1821 by John Espy, the 2-½ story Wagon Hotel on the corner of Baltimore Street and Emmitsburg Road catered to waggoners and other travelers. 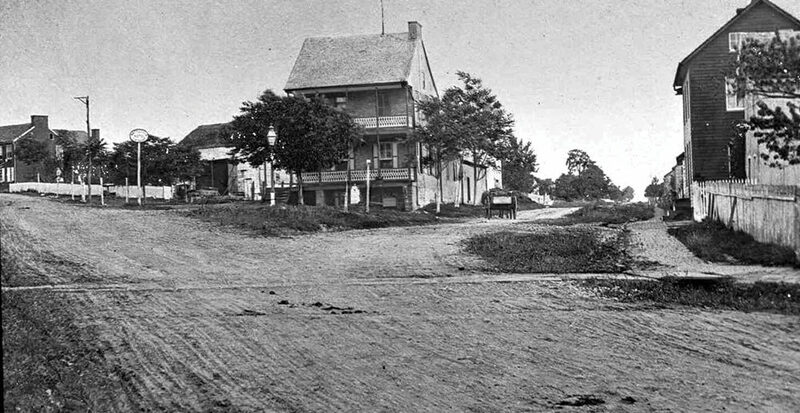 The Wagon Hotel (later called the Battlefield Hotel), shown circa 1886, stood at the corner of Baltimore Street and Emmitsburg Road. It was a popular place to stay for returning veterans 130 years ago. Soon the streets in this view were lined with shops whose wares appealed to increasing numbers of tourists. Over the past decade, these streets and shops have undergone dramatic changes through revitalization to create beautiful and vibrant neighborhoods. In 1863, Union forces occupied the hotel, punching holes in the roof to fire at Confederate soldiers.